Bean soup is one of my comfort foods when it gets cold outside. 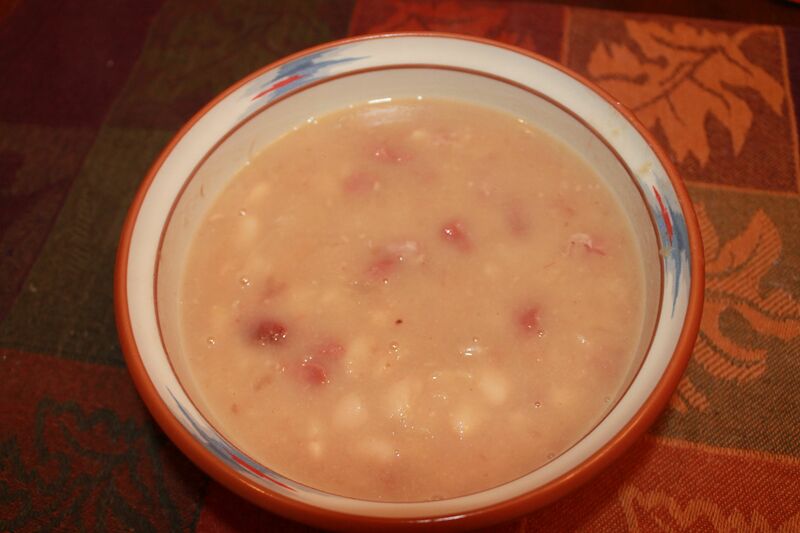 I saved the ham hock from the Thanksgiving spiral sliced ham and decided to make my family’s version of the Senate Restaurant’s Bean Soup. This version makes a smaller quantity and is both thicker and creamier. Melt butter in large Dutch oven over medium heat. Place onions in the pot and saute until translucent. Sprinkle in flour and 2 tablespoons butter and stir constantly for at least 5 minutes. Pour in 1 quart of water and scrap up any brown bits on the bottom of the pot. Toss in the beans, the ham hock, bay leaves and 4 more cups water and bring to a boil. Reduce heat to medium-low and simmer until beans are tender, 2 to 3 hours. Skim off any fat on the surface of the soup. 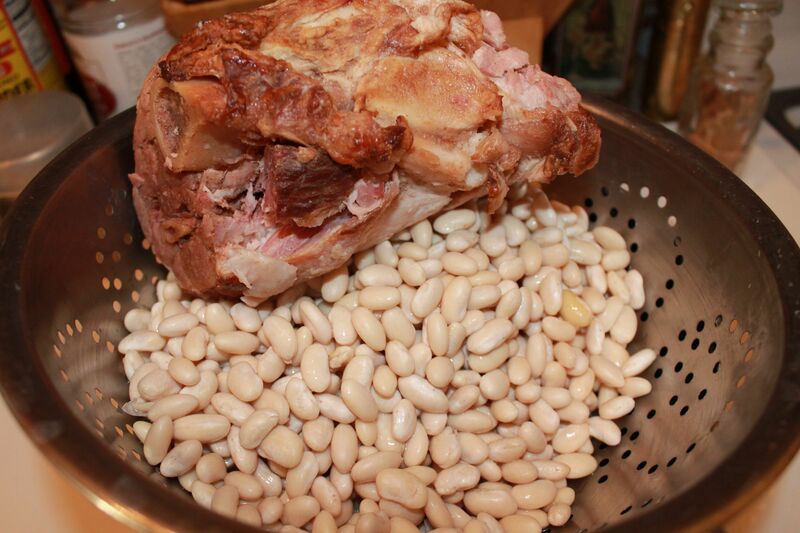 Once beans are tender, remove ham hock and let cool slightly. Place 2 cups of beans in a blender and puree before pouring them back into the pot to create a thick, creamy texture. Remove meat from ham hock, discarding bone, skin, and excess fat; finely chop meat and add back to soup. Season with salt and pepper. This is not a highly spiced soup; it is simple, filling fare. If you’re looking for additional flavor, replace some of the water with broth or even with beer. And a dash of hot sauce is good, too! I had been talking online to a friend about honey and the uses thereof. 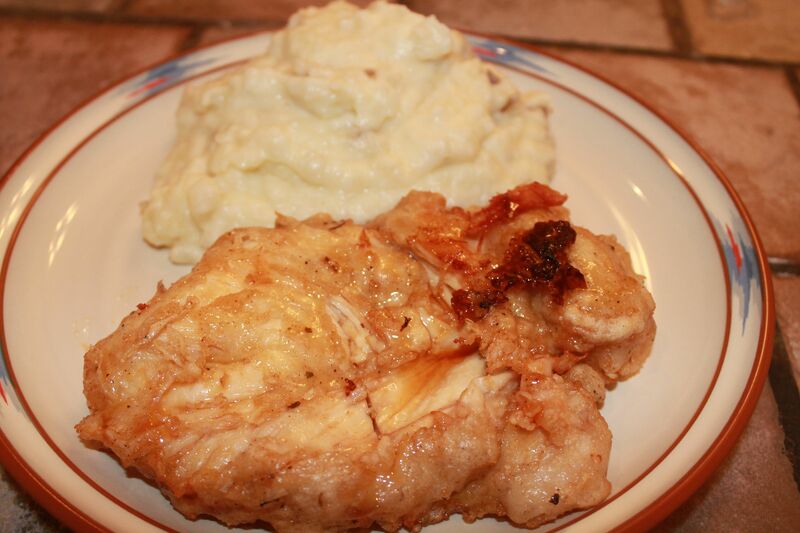 Afterwards, I couldn’t get our conversation out of my mind and so decided I would pull out a recipe from the to-be-tried file – Honey Glazed Fried Chicken. I first saw this one on America’s Test Kitchen but decided that doing it regular fried chicken style with bone-in pieces wouldn’t work for me. After making it, I think that next time I will cut the chicken breasts after brining into quarters for the frying – more coverage area for the batter and the glaze! Dissolve salt and sugar in 1 quart of cold water. Pour into a zip top bag, add chicken and refrigerate for about an 1 hour. Whisk 1 cup of cornstarch with the water, pepper, Creole seasoning and salt in bowl until smooth. Refrigerate batter while chicken is ­brining. Set wire rack on rimmed baking sheet. Place ½ cup cornstarch into medium bowl. Remove chicken from brine and dry thoroughly with paper towels. Coat chicken thoroughly with cornstarch and transfer to baking sheet to rest while the oil heats. Add oil to large cast iron skillet about a half inch deep and heat over medium-high heat to 350 degrees. 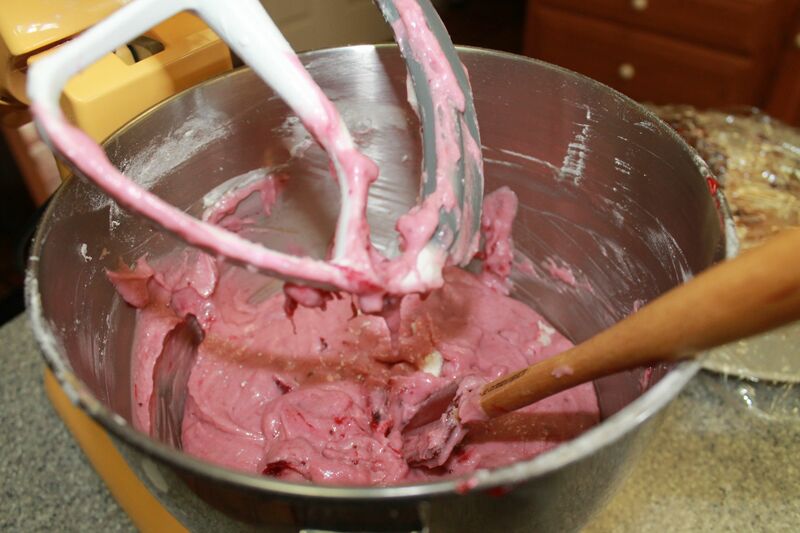 Whisk batter to recombine. Coat chicken in batter and gently place into the to hot oil. Adjust burner, if necessary, to maintain oil temperature at 350 degrees. Fry chicken, moving pieces to keep from sticking together, until slightly golden and just beginning to crisp, about 3 minutes per side. (Chicken will not be cooked through at this point.) Transfer parcooked chicken to baking sheet and allow to rest for 5 minutes. Return oil to 350 degrees. Put chicken back in the pan and fry 5 minutes each side or until it reaches 165 degrees. Transfer to wire rack and allow to cool slightly. 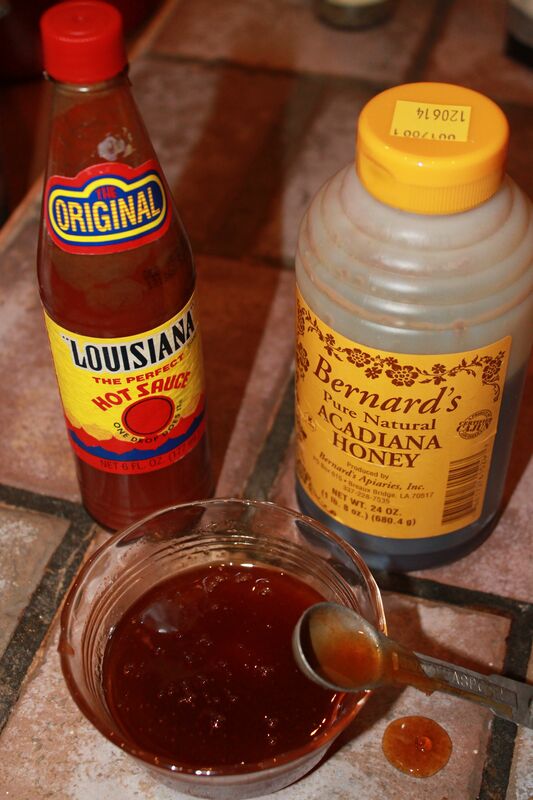 Combine honey and hot sauce in large bowl and microwave until hot, 30 seconds to a minute. Add chicken one at a time to the honey mixture and turn to coat; return to wire rack, skin side up, to drain. Serve. The chicken has a light, crisp crust and the sweet and hot of the glaze is a lovely finishing touch. I served mine with mashed potatoes and it was terrific! After visiting Longue Vue House and Gardens, my friend Charlotte and I went to Freret Street to grab a bite to eat. 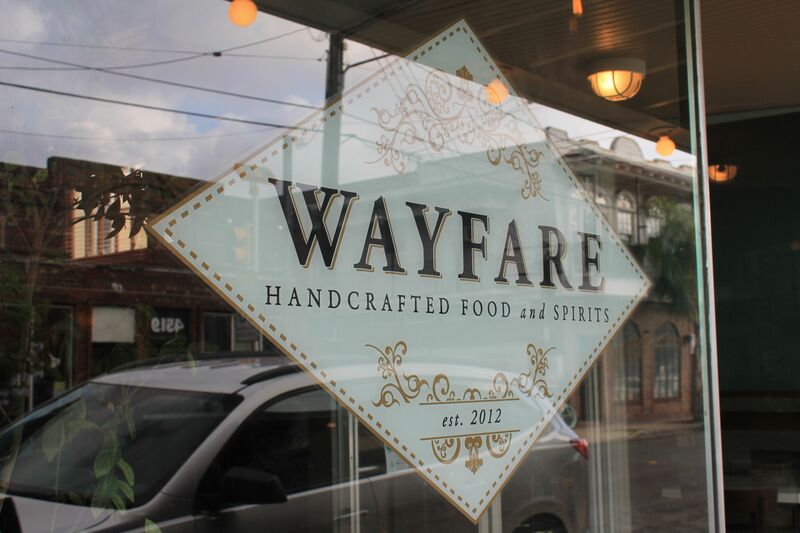 We settled on Wayfare Restaurant. They advertise as having handcrafted foods and spirits. 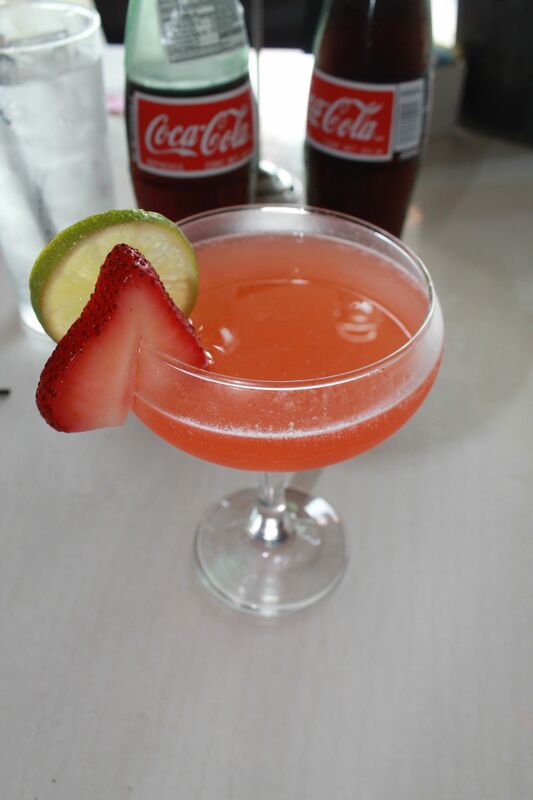 We started with the Ponchatoula Punch – a daiquiri variation with Bacardi Dragonberry Aperol. It definitely tasted like more but, as it was just barely noon, we restrained ourselves. They also had the Mexican Coca-Cola (made with real sugar) so I ordered two. 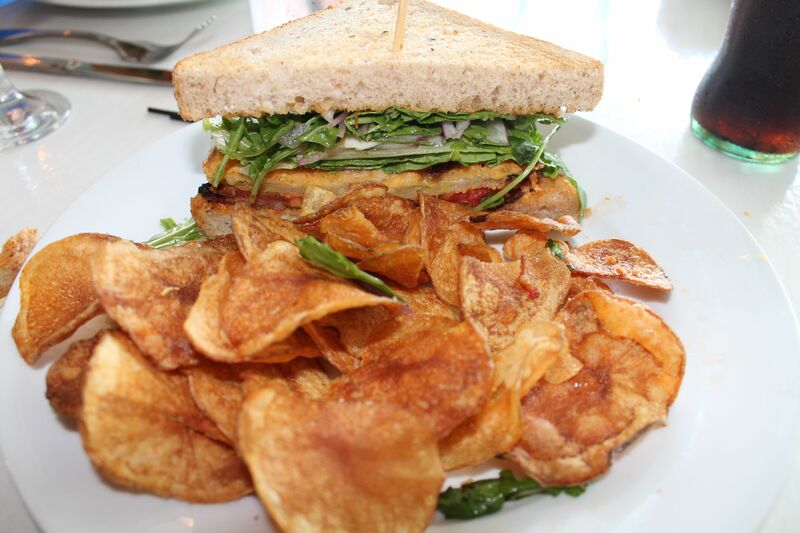 For my meal I went with the BL(fg)T – Kurobuta bacon, assorted lettuce greens and fried green tomato. It had a sweet potato habenero hot sauce that offered a nice contrast to the sour of the green tomato. A good sandwich, even if the bread was a little thick. I took the picture after eating half the sandwich as the pile of house made potato chips was too tall to get a good view of the interior. The chips were light and crisp but could have used a little more salt after coming out of the oil. The staff was friendly and knowledgeable of the menu and the food came to the table quickly. Definitely worth visiting again – even if only for happy hour and another cocktail! In my oh so humble opinion muffins are generally a poor substitute for cupcakes. There are a few exceptions, however. 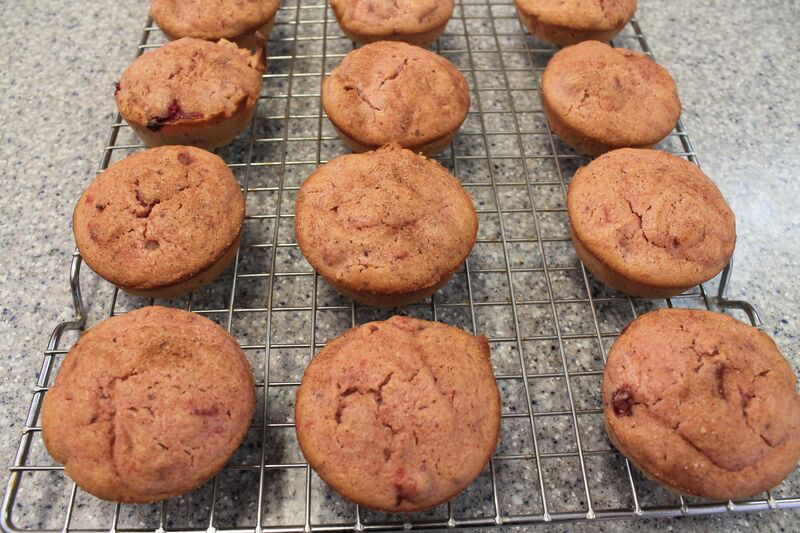 In particular, these muffins which are made from the leftover Thanksgiving cranberry sauce (recipe here) are quite tasty, even if they are rather healthy. If you know you want to do these muffins, just double the sauce recipe to make sure you have leftovers. Preheat the oven to 375 degrees F. Grease a muffin tin or line the cups with paper liners. Use a mixer to cream the butter until smooth. Add the sugar and mix. Add the eggs, vanilla, baking powder, and salt and mix. Add in the cranberry sauce. With the mixer running at low speed, add 1/2 of the flour, then 1/2 of the milk, and mix. Repeat with remaining flour and milk. Continue to mix just until combined. Fill the muffin cups 3/4 full with the batter. Sprinkle the cinnamon-sugar over the tops of the muffins and bake until golden brown and risen, 25 to 30 minutes (a toothpick inserted in the middle should come out clean). Let cool in the pan at least 15 minutes before turning out. These are denser than your average muffin but the flavor is delicious.